How big of loops are you using? 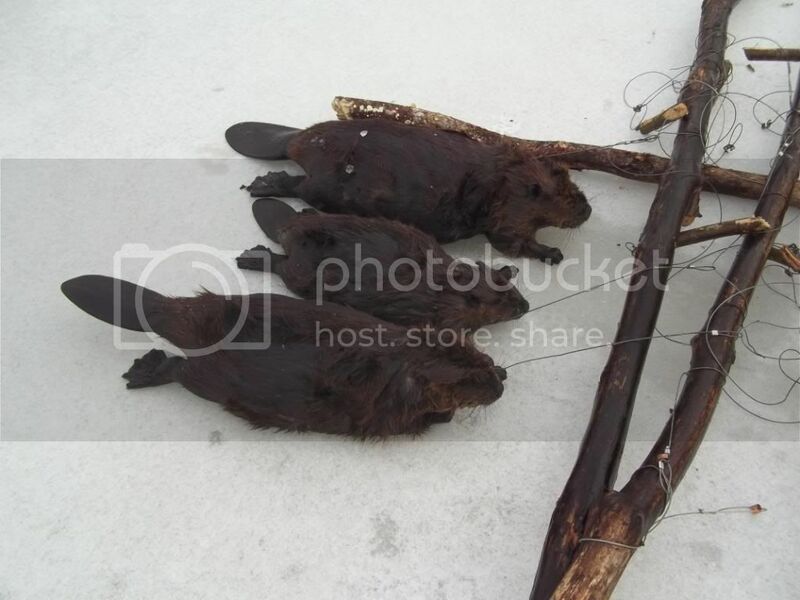 It's kinda funny looking at photos of Beaver trapping down south. Finding the feed bed? Shoot! I have to spend a lot of time finding which side of the house the waters on. Rally, I'm not sure, they are the spikers I picked up from you last year. The snare loop for beaver should be the size of a dinner plate. So about 10" i'd say. That's what I make mine too. Dan what sized cable are you using. It looks very large in the photo. Could add to some pull outs where smaller diameter might be catching better? Rally? Rally, What causes the snares to be pulled tight with no kinks in the cable. Is it just part of the game or is there something wrong with the set up. I'm using 5/64, 7x7, BMI locks and loaded 9" loop. I make sure the snares are not touching the pole and the bait just under the snares. I think you have talked about it before and I can't find it. How big of a hole are you cutting? If you are cutting a hole large enough that a beaver can swim up into it, they will do so, and knock your snares down as they propell themselves around the pole cutting it. I have @26" of ice now and am guessing you may be close to that. I cut a "Slot" in the ice that is roughly the size of a chainsaw bar or slightly larger, and is parallel to the beaver house and about 3' outside of the feedpile. Then I take a bait pole and lower it into the hole until it hits bottom. If the bottom is hard, I pull the pole back up and sharpen the bottom of the pole with a long skinny point, like a pencil. If it is a loon poop soft bottom I leave the pole cut square. I then lower the pole back to the bottom and just let the pole stand on it's own weight. I then reach under the ice and grab the baitpole with my hand so that the top of my hand is against the bottom of the ice. I then lift the pole back out and put a small mark at the top of my hand on the pole with my hatchet, so I know where the bottom of the ice is at.I then put top of my snares about 2" below the mark on the pole(the nail on your spikes).If it is a hard bottom pond, I then put my bottom two snares so that the CENTER of the loops are aproximately 18-20" from the bottom(imagine a beaver sitting on the bottom and chewing on the pole)because that is what they will do if it is a hard bottom. If it is a soft loon poop bottom, I just put two snare about three inches below the bottom of top two snares. I put a "score" on the pole where each snare is closest to the pole.Then I run my safety cable through the bottom two snares loops, and then up through the top two snares. 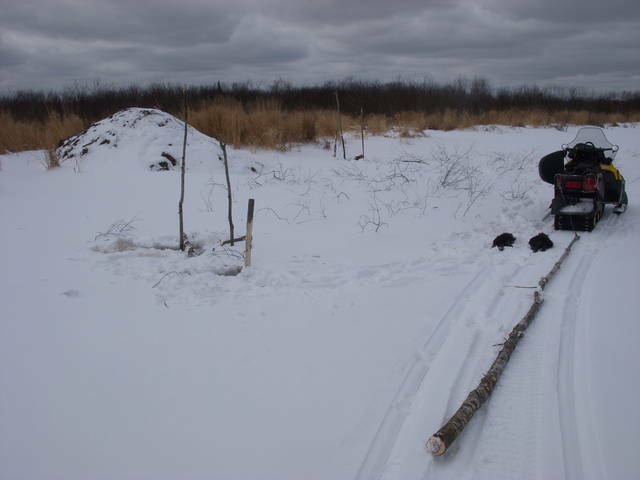 I then lower the pole through the slot until it hits bottom, and then turn the pole 90 degrees so that the Spikes are pointing to and away from the beavers house/lodge/bank den/most likely direction it will approach. What this does is put the snares directly below the bottom of the ice, points the scores to and away from the house (which is a beavers most likely direction of travel as it leaves or approaches a feedpile/cache), and puts the pole in an area where the beaver most often has a run coming out of the house, adjacent to the feedpile/cache (for the Canucks). The reason for such a long answer is that I am using the exact same snare you have(5/64" Beaver Spikes)and the beaver are pounding popple here right now.I'm guessing you are cutting too large of holes and the beaver are coming into the holes to work the pole and knocking down your snares with their feet.Heres a couple pictures from the same colony I got the triple in two days ago. Picked up two small ones today from the same three poles and the third pole was cut in half with no beaver. Probably the same answers as I gave DanS. There are only a couple ways I know a beaver can pull a snare loop down tight and not be caught. The beaver swims by your pole with a brushy limb and the limbs pull the snares down completely shut. The beaver catches the snare loop between their body and their front foot and swims away from the pole.The beaver cuts the pole in half and drags the pole around on the stick lined bottom and pulls the snares shut. The beaver catch the snares between their toes as they propell theirselves around the pole and pull the snares completely shut,or have been caught by a front foot and pull the snare off their fron foot with their other foot and pull it completely shut, and doing so quite often pull the spike off the pole or bend the cable slightly. I've had snares pulled down with small tips of limbs in them many times, and have also caught beaver that had limbs pinned against their bodies by the snare, that they were carrying back to the house. In some ponds/lakes muskrats will knock down alot of snares, while they chew on the baitpoles, but this is easily recognized by the small bite mark patterns, and sometimes I catch a few of them. When the rats are doing this though, the loops are usually just dropped down to about a three inch loop. Last edited by Rally; 03/01/12 11:55 PM. Thanks for taking the time to answer my questions Rally. The information that you have shared would have taken me years to figure out, if at all and my success rate has increased greatly because of it. 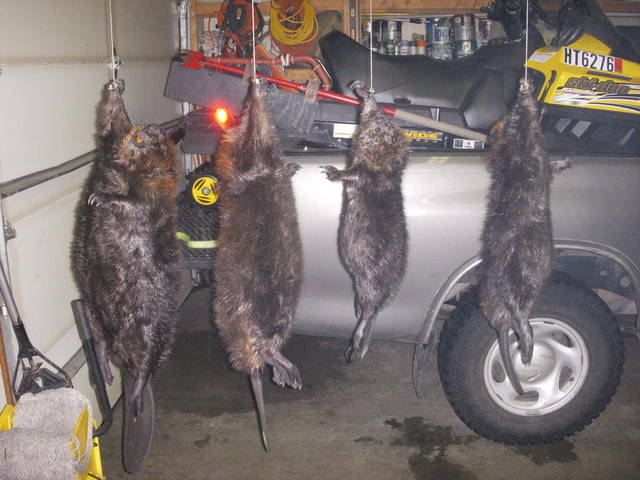 This house was set with 5 poles and the first check produced 3 beaver. I only reset 4 poles and the next check took 3 more and pulled my gear. Not all of my set ups have worked this good, but you sure put me on the right track. There is not much popple in the area I'm trapping and too much walking to carry green poles in so I have to settle for bait sticks. Thanks for the info Rally, I am trying to set them the way you are saying. 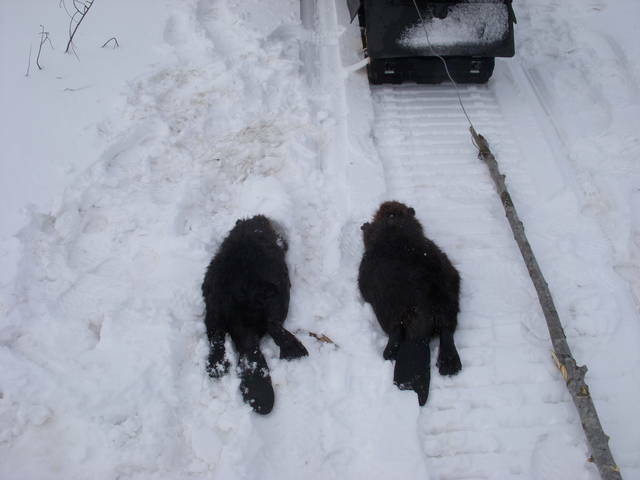 I am using the 3/32 7x7 cable to try and keep the otter out of them, we are only aloud 3 otter in Michigan and are so over run with them I try do do what I can to avoid getting over my limit. Crowley, Glad to see it is working for you too. Rally : You are a much more accomplished beaver trapper than I am. So maybe you have already tried this . I sharpen my pole and do as you do by pushing my pole into the mud to determine it's intended height. I then cut a notch on the pole at ice top level and remove the pole. Now lower the axe and then pull up until the bottom of the axe locks tight on the bottom of the ice. Keep your thumb on the axe handle where it meets the top of the ice. Remove the axe and lay the head on the pole at the notch. Cut a notch on the pole a few inches below your thumb position on the axe ( allows for thickening ) and set snares down from there. This avoids sticking your arm a couple feet down into the water to determine ice depth. Of course removing your cloths and sticking you arm in the water is sometimes hard to avoid. 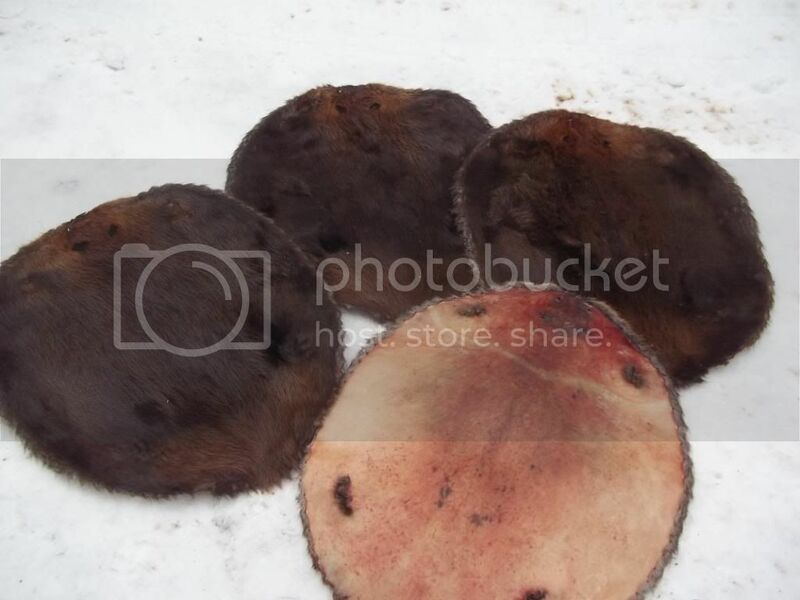 Like when you set your holes to close and a beaver is caught by the front leg and tail in separate snares. Oh I have a double - nope. Won't do that again. I use a piece of 1x2 with a small L shape at the bottom. It's marked in inches and is perfect for getting ice depth. Learned early on that sticking my axe and/or chisel into the water only glazes it and is too hard to hold on to. Yup - a chord loop for your wrist is pretty important to avoid losing that expensive spud. Without one it's a matter of when not if. Nice stuff guys! I use 90% snares also, and try to stick with bank runs if I can. But this year, I am trapping the tangled mess around the houses. As it gets warmer, I have to weight or wire my poles down to keep them from coming back up through the hole with the snare, or just use 330's. One thing with beaver snares I have found, they have to close smooth and fast. If I have a batch of snares that are built or loaded just right, I get all kinds of good borderline catches, front feet, tail, even a mouth catch once. If the snares dont work like greased lightning, the beaver has to hit it just right to get caught. Post edit: LOL. Now that I read back in the thread, there has been alot of good info on this already. Wow. Thanks guys and gals. I'm going to be trying some of those sets. Last edited by trappin moose; 03/03/12 08:58 PM. Understood Rally - I was trying to keep your arm dry. There is a photo of a few hides Rally. My wife often asks me why I just don't take a bar of soap with me. I'm a softy, I wear a 31" gauntlet on one arm most of the day. I clean the holes with one hand so I don't have to carry a skimmer. Love the color. 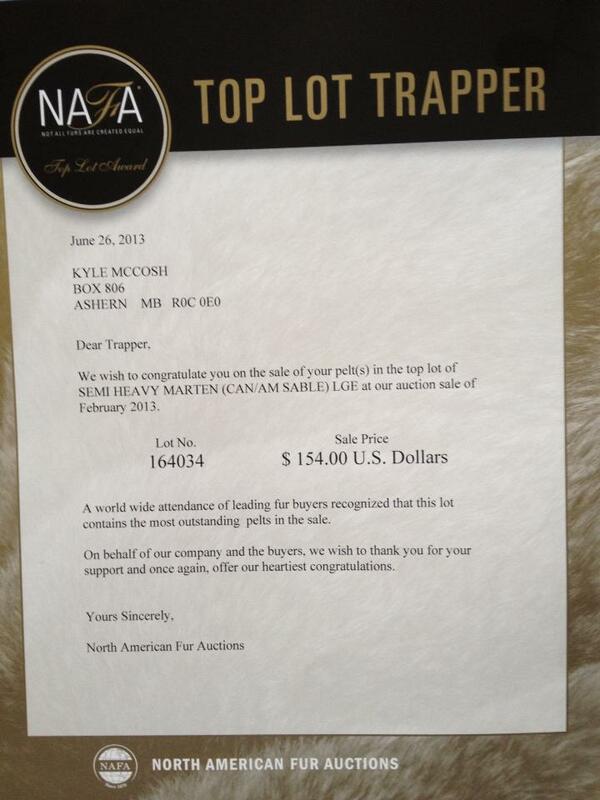 Looks like you take alot of pride in your put up too. Here's todays run. 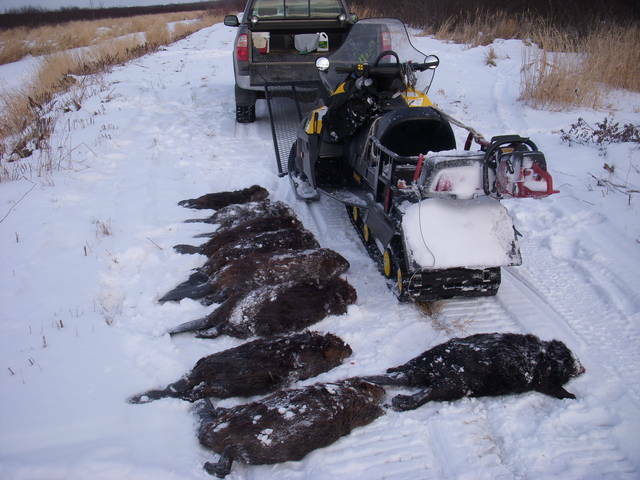 Check out the beaver in back of the snomo, and the second little one from the top. Both black and from the same house.